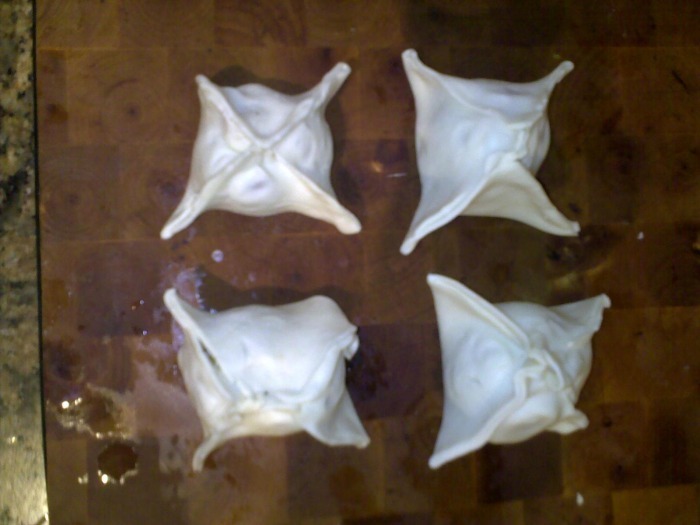 In this page, you will find recipes that I have personally cooked for our family and friends. Some of them are my classics that I have cooked over and over for many decades, some are simple, some are more elaborate, most of them have been learned by watching my Mum cook or have been inspired by dishes that I have experienced at the many restaurants I have had the chance to visit privately or part of my professional travels and all the Chefs that I admire. Curiously, I do own a very limited number of cookbooks - less than 30 - some vintage ones like the Pellaprat, La Cuisine Lyonnaise by Felix Benoit and Henry Clos Jouve gifted to me by a very francophile friend, or Les Carnets de Cuisine de Monet, not to mention my Mum's own compilation in tidy handwriting that she accumulated over the years and organised over the last 10 years. I also have more modern ones by Jamie Oliver, Frank Camorra, Greg Doyle and Matthew Evans, the last three being my Australian collection. I continue my exploration by attending cooking demos here in Australia and I have the pleasure of being quite chummy with people like Colin Fassnidge, Mike McEnearney, Tony Bilson and others whose recipes you will find scattered on the main blog. When I started this site in early 2010, I didn't have a digital camera apart from the camera in my E71 NOKIA phone...hence some of the not so sharp images in the older recipes...In June 2010, I received an Olympus E-PL1 with a 14-42mm zoom that I have used extensively up until the arrival of my iPhone 5S, which I use a lot for quick shots during the cooking process. I have also been gifted a new prime 17mm lens for the Olympus in May 2014 by my children. This lens is extremely quick and sharp and I use it primarily for composed shots or when visiting Michelin level restaurants. And now we know! I got an iPhone 6S+ and a 7+ which I use for interviews, both have astonishingly good camera. I am expecting an iPhone X and a new 42mm prime for my Olympus PEN this month! ​I never use filters, and rarely use flash or Photoshop, so what we eat is what you get! Enjoy the journey and bon appétit! Aubergines a la riste | A recipe from my Mum's grandmother! Now that our shallots and the sauce are ready, we will need to be ready to quickly cook the "frites" and the steaks AT THE SAME TIME. This requires to have both the grilling pan with no oil and that canola oil at the right temperature before you start. This is the tricky part if you want your frites to be crunchy and your steak still rare, as the onglet can't be overcooked to keep its juiciness and taste. You will need 3 minutes to cook the stakes on one side and the frites for the first time. 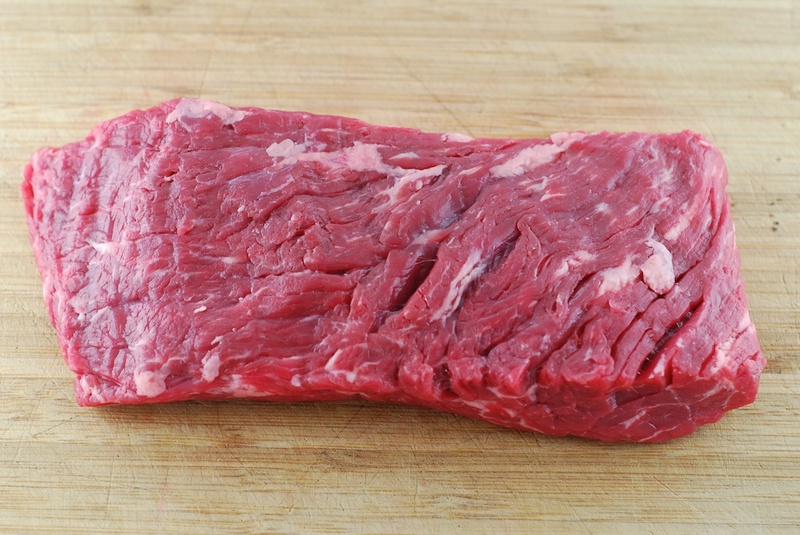 When cooked, remove the fires from the oil and drain them of oil on kitchen paper, then turn the steaks over. Wait until the oil is hotter than the first time and fry the frites once more for approximately 3 minutes. Before you remove the frites from the oil once cooked, turn the heat off from under the steaks, so they have the time to rest AND the oil, for obvious security reasons. Drain the oil from the frites once more and then start plating on warm plates. First, the shallots and some sauce, then the frites, making sure the sauce doesn't touch them, and then finally plate the steaks.Serve and let each person season to their own taste. Serve with a good red wine, probably a Côtes-du-Rhône or a Bordeaux. In our case we had a Rioja from Spain. You need something robust enough to cut through the metallic taste of the meat. So in that particular instance, I would not serve a Pinot Noir or a Merlot. You need a GSM or a Cabernet Sauvignon. Bon Appétit! During that time, wash, peel the potatoes and cut the "frites"
At the same time, start cooking the steaks on one side on a very hot grill and no oil. I already had all these beautiful ingredients from my usual Friday food shopping and from my foraging at the Overweigh Market on Saturday morning: Fresh garlic from Gilles Bonin, basil, truss cherry tomatoes, fennel, fleur de sel from Olsson's, black and white peppers from Cameroon found at The Essential Ingredient and inspiration found in my Mum's and my own recipe books. First, we need to prepare the tomato sauce. Cut the Spanish onion in small cubes and pour some olive oil in a small pot and cook for a few minutes, until the onion is transparent. Add the tomatoes cut in two and cover. cook until skins are easily removed. 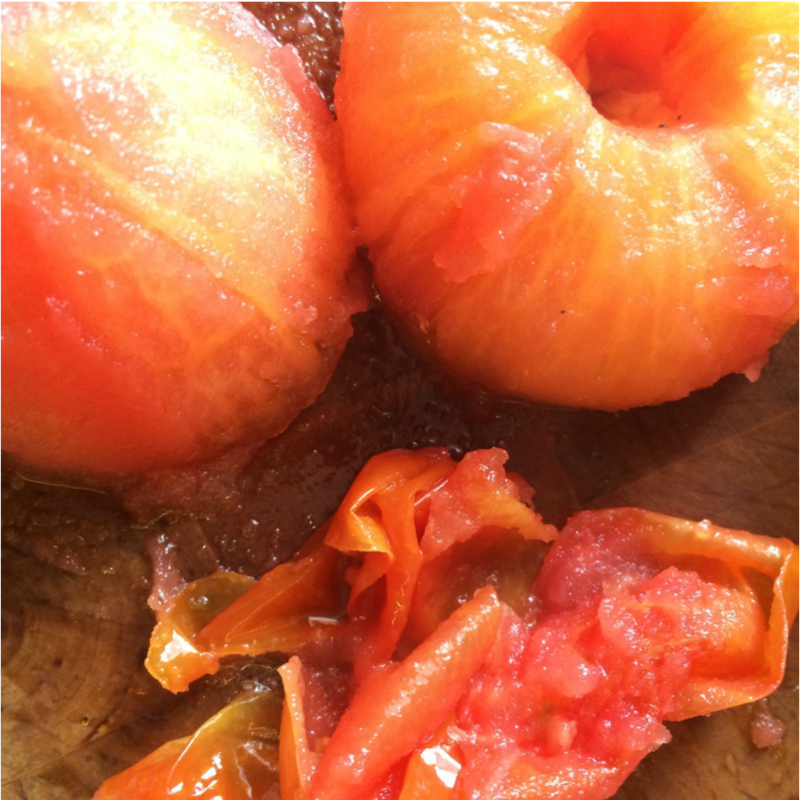 Then, take the tomatoes out, remove the skins and put the tomatoes back in the pot. Purée the tomatoes with a manual blender. Now it is time to add the seasoning: sea salt, peppercorns, basil and some of the ferns of the fennel...Now some people will want that sauce thicker and will add some tomato paste. This will also add sugar to the sauce. I have gone the other way and add some vegetable stock, so, it can reduce over time. And now, on to the fennels...You should actually start this half way through the preparation of the tomato sauce. Cut the sprigs from the fennels and cut them in two in the thinner length of them, so they can cook quicker. Add olive oil to a pan and put the fennels in once the oil is hot enough. Cover and let cook on slow burner. Add some thyme a little later. Now, it is finally time to prepare the monkfish. Ask your fishmonger to fillet it and debone it. This one was not deboned properly though... 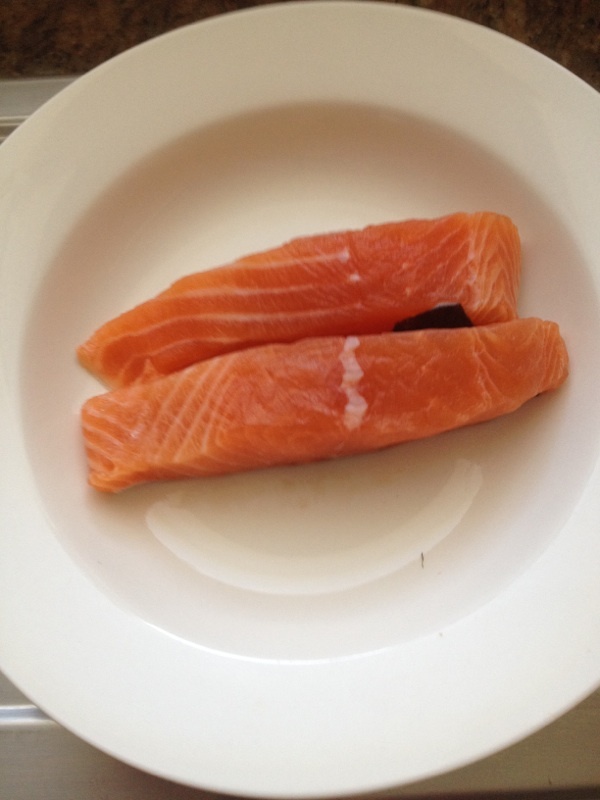 In a pan, pour some olive oil and just rest the fillets on their skin, so the flesh of the fish doesn't stick to the pan. Some people would dust the fillets with flour, but I don't like to do that, unless I do a curry of monkfish. Make sure it is cooked through but not overcooked. Cover the pan for even cooking. Add half a glass of white wine towards the end of the cooking process. A busy stove, with the monkfish, the fennels and the tomato sauce all going. 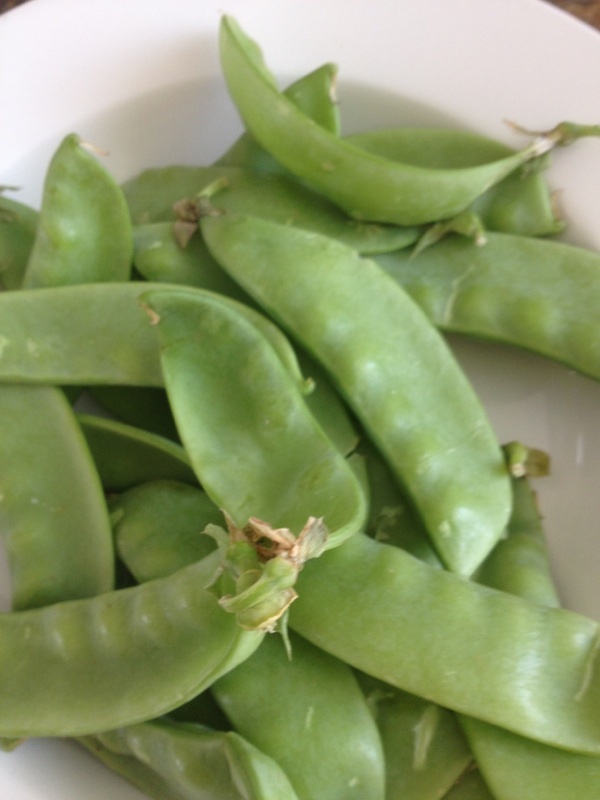 I was inspired by Brent Savage's cooking at the Pyrmont Growers Market this morning, and decided to try to prepare my own version of his asparagus dish for our Sunday lunch. First, cut all the asparagus at the same length, about 12 cm each and cut some of the leftovers in thin slices. Shave a few cloves of garlic, throw everything into the pan with the olive oil already hot. Season with salt and pepper, cover and cook on high heat for about 5 or 6 mn. Remove the garlic before it might burn...and reserve. Warm your service plates in the oven at 60 deg during that time. Also shave the radishes, remove the scallops from their shells, cut the coriander stigs and reserve. When cooked, deglaze with the lime juice and plate the asparagus in a triangular pile - 4 at the bottom, then 3, then 2, then 1. Spead the garlic around the plate and keep warm in the turned off oven. Quickly grill the scallops in a pan ( I would recommend you clean the pan you used for the asparagus beforehand or use a new one, as you don't want the scallops to get the flavours of the asparagus, garlic and al...). When the scallops are grilled and just cooked through, finish the plating with the radish, coriander, and more ground pepper. Et voilà! Brent Savage prepares an egg emulsion that looks like an aioli with a sous vide machine - but I have not tasted it and I arrived too late to get the whole story. So, instead I decided to cook shaved garlic with the asparagus and the truffle olive oil to add some flavours to the dish. Monkfish (lotte in French) is an elusive catch in the Southern Hemisphere, and with the approach of winter, one can be lucky to find some from New Zealand at the Sydney Fish Market. I bought a whole fish last week and cooked the first lot (lotte?? ?...lol) in a curry sauce and served with rice and grilles asparagus, one of my favourite ways of preparing this quite meaty fish. I will not insult you by giving you a recipe of the curry. It is quite straightforward. 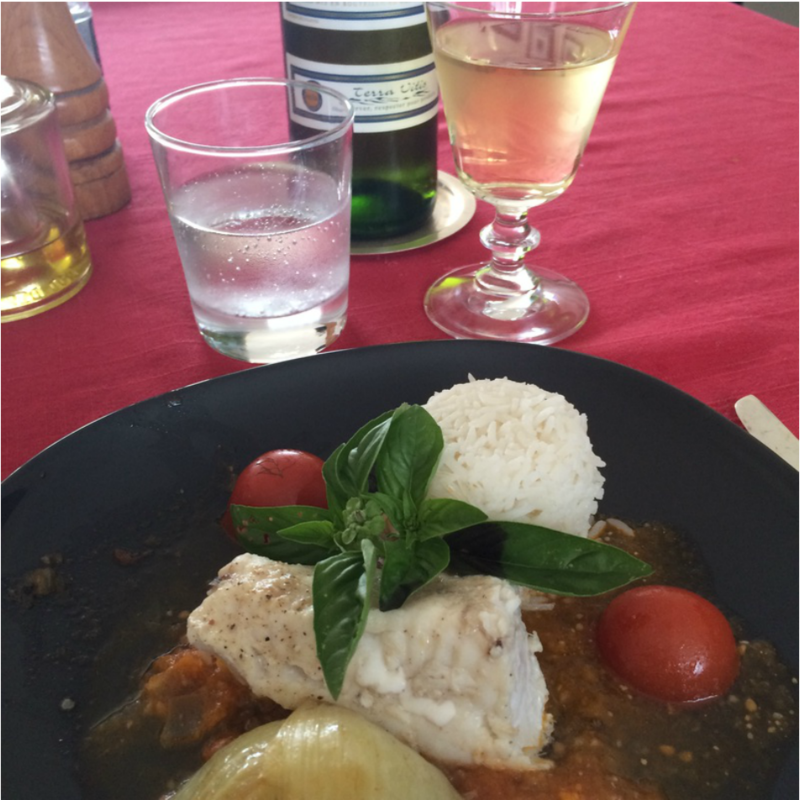 The monkfish is just dusted with flour and cooked quickly in a pan until golden and cooked through. 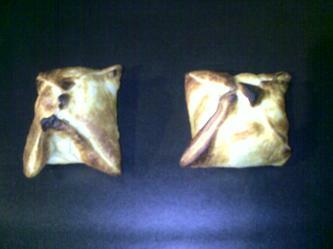 The other recipe is quite simple too, and was originally designed by French Chef Jean-Pierre Crouzil, mentioned earlier. 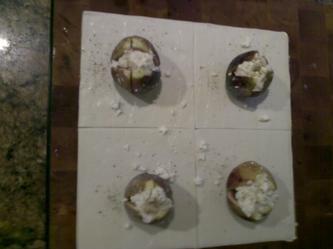 Warm your service plates in the oven at 30 to 40 deg C. Boil the potatoes cut in pieces for about 20 mns in salted water. During that time, remove the stones from the olives and reserve. When the potatoes are cooked, drain them, crush them with a fork in a deep plate, and mix with the olives. Remove the plates from the oven, get a ring of about 10 cm in diameter and fill with the potato and olive mix. Remove the ring and put back in the oven. Plate the potatoes and olives mixture in a ring. Add three olives on the top for effect! In a pan with quite a bit of olive oil and very little butter, roast the monkfish pieces for about 3 mms on each side, until golden (that's why you need the butter for...). 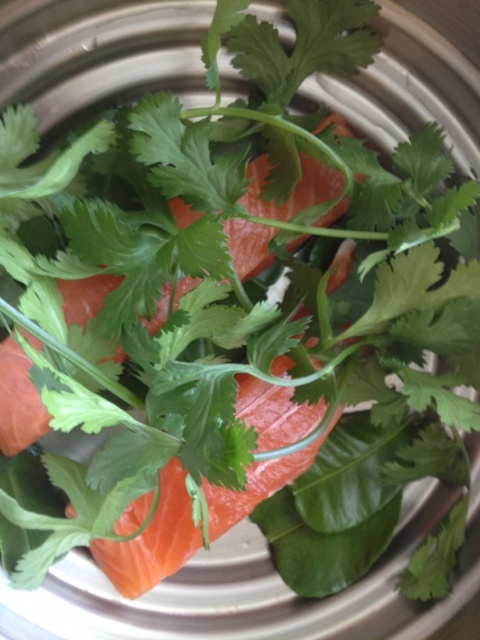 During that time, prepare the salad in a bowl, season and toss it, ready to be plated. Once the fish is cooked through and golden, remove the plates from the oven and plate quickly. Add cracked pepper and a drop of olive oil on the fish, arrange the salad around the plate, deglaze the juices from the pan with a squeeze of lime and pour on the side. Entre Deux Mers - Chateau de Fontenille , multigrain baguette from Pierre Labancz and cheese from Willowbrae and John Clanon - perfect! 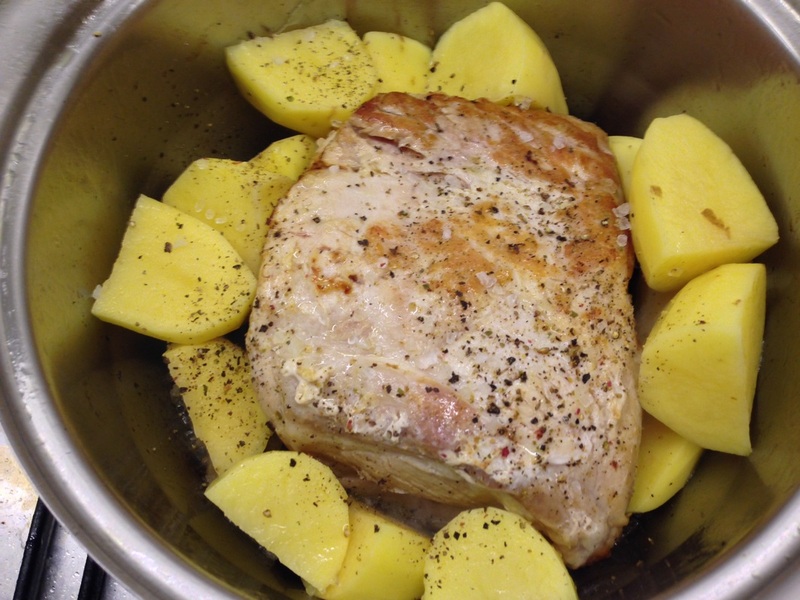 A good way to eat pork is to cook it slowly with onions, garlic and two different types of potatoes, like Dutch Cream and Desiree, one staying firm and the other one kind of disappearing in the sauce. I have to give credit to an old Parisian friend, Francois P and his family, who invited us to his farm near Chambord on Election Day, where the whole family congregated in the village where they were all registered to vote, being from the region. Over the course of the morning, each member of the family added their own ingredient to the dish, herbs, more butter, a bit of white wine, you name it. It is one of my most memorable country lunches, and after lunch we went into the adjacent forest to pick up mushrooms - I don't have to tell you what we had for dinner...An Australian friend who was visiting, Michael C. had a great time as well! When done, add the potatoes cut in large pieces. Season to your taste. Cover and let cook on very low heat for at least an hour. Check frequently for moisture. 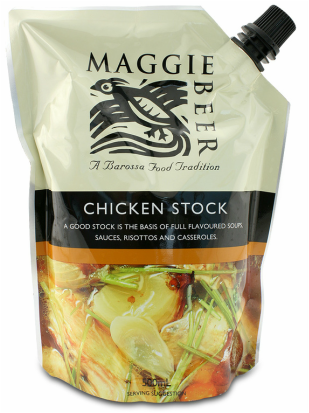 Add vegetable stock - Maggie Beer makes the best - regularly. Add a bit of white wine if you have some handy! Add garlic cloves 90mns in and let cook for another 30mns. You can add rosemary and thyme if you like. After two hours, the Desirée should just be naturally mashed potatoes mixed with the onions that by then should have disappeared in the sauce. The Dutch Cream should still be firm. 1 kg of potatoes and 600 grs of pork should do for 4 people. 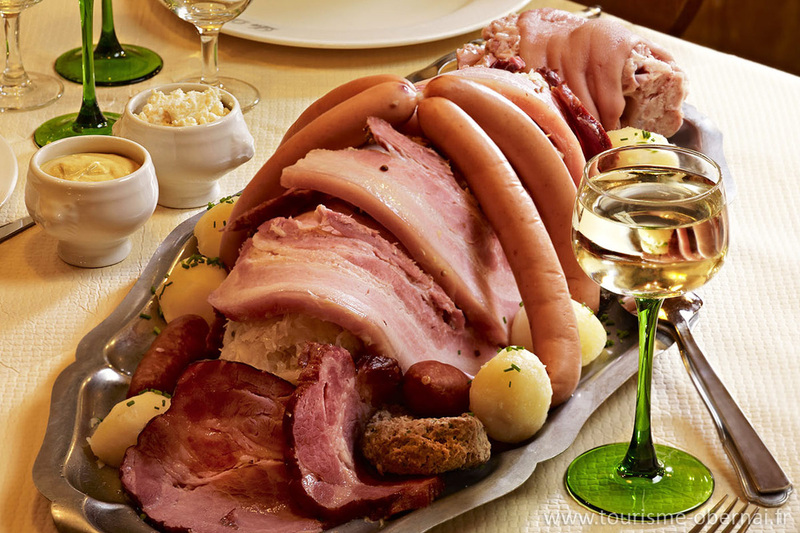 A chilled Gamay de Touraine or a Beaujolais if you can't get a Gamay would be the perfect match...Bon Appetit! Potatoes, salt and pepper awaiting the stock...not for long! Asian dishes are not my forte, although I like the so called "fusion" food. So, from time to time, I am trying to cure myself and dig into my cookbooks and cook something new. And it not often that it is successful and worth talking about. So, it is with a certain sense of pride that I can report that today's experiment will make it to this blog! And, having documented the whole process, you will be exposed to an avalanche of photos and a few words of explanation. Let's start with the tomato broth, as it is the time consuming part of the recipe. It is inspired by a recipe of Greg Doyle from the now defunct Pier restaurant in Rose Bay. In a small pot, put some olive oil and onions and then some very ripe tomatoes. I usually cut tomatoes in half, keeping the skin on and cook them for 10mns or so, until such a time where you can take them off the pot and remove the skin easily. Only then do I cut them in pieces and let them cook some more. 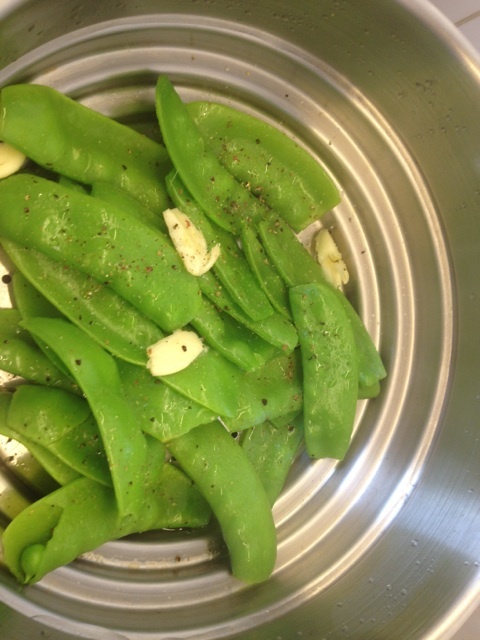 At this stage, add a few cloves of garlic, salt and pepper. The next step calls for ginger and coriander, and lemongrass and chillies, which i didn't have, so I used a few drops of Tabasco instead, some soy sauce and a beautiful chicken home made stock. The first written record of this confection was in “Larousse Gastronomique” by Proper Montagne who noted that it was created by Fasquelle, a patissier along rue Bourdaloue in the middle of the 19th century who named it after Louis Bourdaloue, a famous French Jesuit from late 17th century. The recipe is quite simple: first you have to make the "frangipane"Velvety almond cream, warmed up with just a hint of vanilla, the 'frangipane" gives any pastry delicious added richness and texture. 3/4 teaspoon vanilla extractEt voila! Combine all the ingredients in a food processor until a smooth, creamy paste is formed. It will makes enough for 1 large tart or about four tartlets.You can use either puff or short crust pastry for the base. Fill the pastry with the frangipane, plonk as many half pears as possible in it and bake for half an hour. You can use fresh pears if they are very ripe or ones conserved in syrup if you are lazy... Serve with a nice cup of tea. Et voila! This is quite a simple recipe and rather unusual as well, but well worth it. Make a compote with the rhubarb and sugar, add a pich of cinnamon and refrigerate. Cook for 8mns in an oven at 180deg . Wait 4mns and unmould on your serving plates. Et voila! No need for sauce as the rhubarb and the lime will give you the sweet and sour taste and juices that are the trademark of this recipe. Drink a robust white wine, like the Riesling of Hospices de Strasbourg I chose. Maybe an oaked Chardonnay might work as well. Why not sharing your experiments via our comments page here? We would love to hear from you! Got the inspiration from a recipe in Wine by Gourmet Traveller (WGT), but had different ingredients, so just used the method to prepare the pork belly. 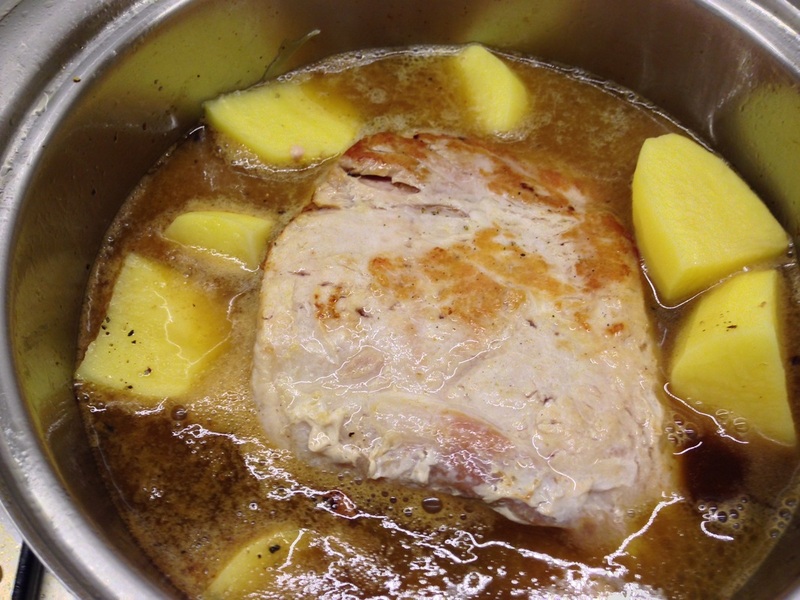 Ideally, you want to marinate the pork belly in advance with fennel seeds, garlic, lemon juice and olive oil. 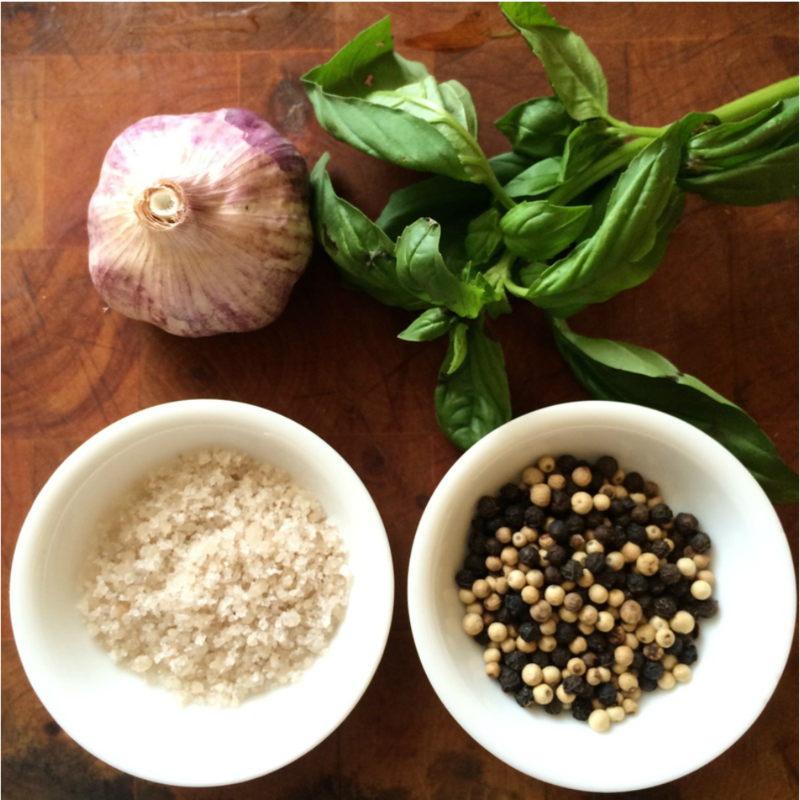 Season with sea salt and ground pepper. I replaced the fennel seeds with cumin and cardamon, and rubbed the meat into ihe spices with salt and pepper than generously poured lime juice and olive oil over it in a bowl, and left to marinate until the oven was ready. Asked later as he was serving some in his restaurant the other day, Maitre Karl told me how it is prepared there: first baked in a steam oven then under the gill until the fat layer becomes crackling. In absence of a steam oven, I used my grill instead, and turn the meat over several times until the meat was cooked and the skin crackled. WGT recommends to start on the BBQ and then finish in the oven...your choice! Just make sure the meat is well and truly cooked. 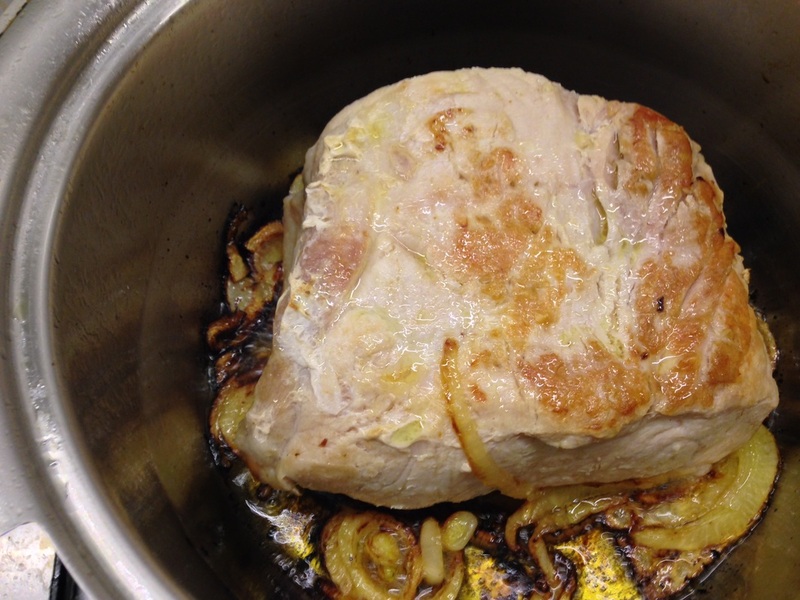 Five minutes before the pork belly is ready, let's say about 45mn after the meat has been in the oven, put some olive oil in a pan, and cook the tuna to your liking. In my opinion it should still be pink in the middle, then when cooked on one side, throw the spinach that you would have washed before in the pan, turn the tuna over and then cover and turn the heat off. I drank my favourite red with it, but you could have a nice Chardonnay as well. This is a simplified version of a recipe by Eric Briffard. His name might not ring a bell immediately, as Eric is media shy but certainly not unknown: he trained with Joel Robuchon at Jamin, and now runs the show at the George V in Paris. He was until October 2014 where he was since 2008. 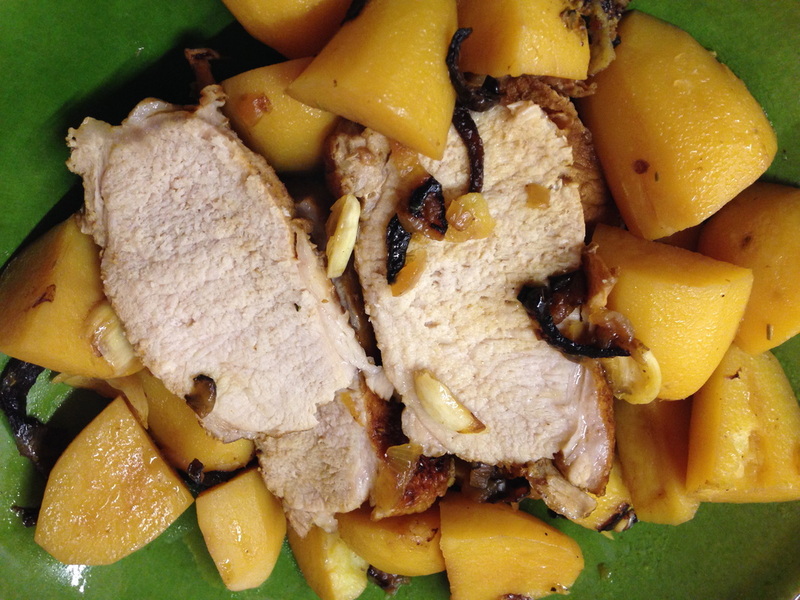 He was supposedly not adventurous enough...Try this recipe and share your opinion. So, you get the simplified version, because I could not master the real one, and my Valentine of 25 years waiting to be impressed! I will now walk you through the five steps mentioned above. And it will not be in the same order as I did it - which was messy to say the least - but in a more logical order, as if I were to prepare this dish with my first experiment in mind. A few hours before you start, put the raisins into warm water for them to regain plumpness and moisture. Just before using them, blanch them for 5mn.Set aside. First thing to do is to remove the scallops from their shells and separate the meat from the red part, called the roe. Reserve. Then, peel the prawns and reserve the heads. Simmer the heads in just enough water to cover them for 10mns. Set aside. In a sauce pan, pour a little olive oil, fry the roes, add 1 or 2 pinches of curry powder, lemongrass, lime zest, prawn jus and top up with 100ml of water. reduce by half, add butter and reduce again to a syrupy consistency. Strain the sauce into a small pot, add the roes, the prawns, half of the raisins, the juice of a lime and plenty fresh coriander. If your sauce is warm enough, the prawns will cook gently without further heat. You can simmer for 5mns more if uncertain. Set aside. With a sharp knife, cut the cauliflower florets in very small pieces to look like a coarse couscous. Season with white balsamic vinegar, Colombo spice, salt and pepper and olive oil. Set aside. Peel the mango(es) and cut as many round pieces as you have scallops. It is easier said than done! Set aside. Chop the remaining fruit into small cubes. Cut the dried apricots in small cubes too. In a bowl, mix the mango, the apricots, the raisins, some coriander leaves chopped finely. It might be useful for the presentation to add a little bit of gelatine - soaked into water previously, so the mixture keeps a certain consistency, but you do not want to make a jelly! I have not tried that, but I am sure it would help the next process. You need to get some rings - same number and size as scallops. On a tray or a flat dish, pour the fruit mix into the rings and press down. Put a slice of mango on top on each ring, brush with olive oil. Now it is time to cook the scallops in a drizzle of olive oil and a pinch of curry powder - you could also use some saffron - no more than 30 seconds on each side unless they are particularly big and thick, but make sure you don't overcook them, as they would become rubbery and ruin the whole exercise! When cooked, quickly put a scallop on each fruit mix, add a prawn and tuck a long stick of dill in the middle of the prawn, like a little antenna. Pour some of the fish stock than you have just warmed up in the microwave for 30 seconds or so on the fishy tower and serve immediately. Bathe yourself in the well deserved applause!!! Don't forget to serve the Chateau Carbonieux in your best glasses...Enjoy with no moderation. Place into a tray sprayed with olive oil and bake in the oven at 220 degrees for 20mns et voila! On a large plate, lay some roquette, place some trevise in the middle, place three thin slices of prosciutto at 120 degrees from each other, place a cherry tomato in the middle. Then, cut figs in two and place them in each space between the slices of prosciutto together with a bocconcino. Prepare a vinaigrette with sea salt (we use sel de Guérande available from Salt Meat Cheese), pepper, Chardonnay vinegar and olive oil. Pour the vinaigrette on the salad and serve! First going to our fabulous Sydney Fish Market, wandering the de Costi and Claudio's stalls to get an inspiration and pick a whole fish or some fillets or, if a lighter meal is the order of the day, maybe some oysters, prawns or mussels. I would also normally check out cheese, olives and other treats at the Deli and maybe some herbs, avocados, figs or other exotic fruits and vegetables at the Waterside Fruit Connection. Today, I bought some snapper fillets at De Costi and some basil and zucchini flowers at BFC. On the way back, I stop at the Moana Bakery - now LABANCZ - in Rozelle and possibly at Vintage Cellars in Ultimo, where my friend Ben Hughes will have a nice chat or recommendation. Today is a Sauvignon Blanc day, Selaks from New Zealand. Then, back home to prepare a nice table and start cooking. In a large pan, drop a little olive oil, thin slice the onion, heat the oil and when sizzling, drop the onions in, add salt and pepper. 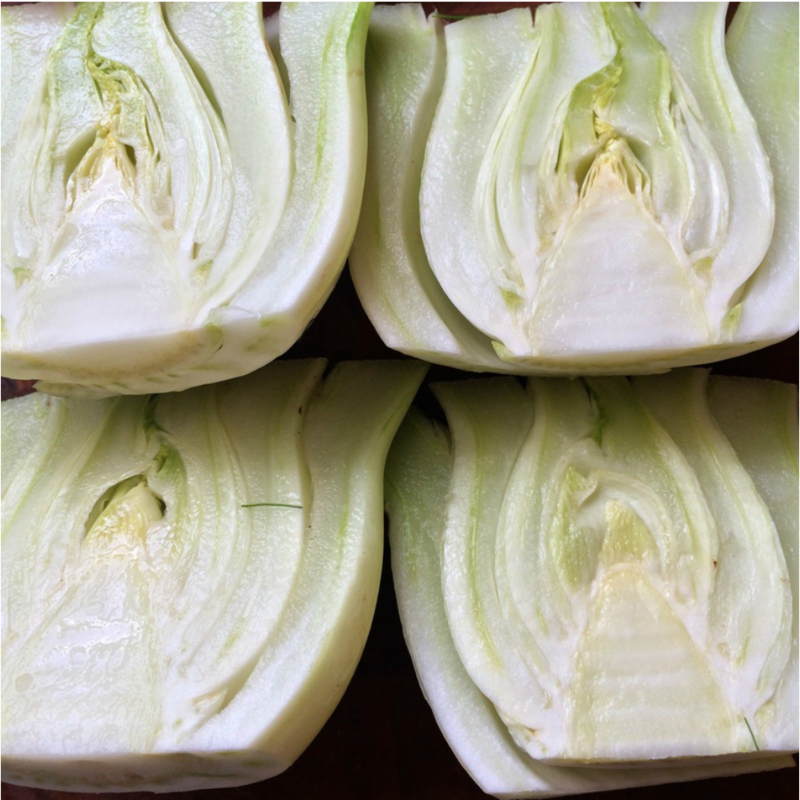 Then cut the ends of zucchinis and when the onions start to melt, add the zucchinis on top, season and cover. Turn the zucchini over every five minutes to cook evenly. Start your grill, so it is very hot when you are ready to cook the fish. In a food processor, grate the pecorino, add the pine nuts, install the blade, add the basil leaves and start the motor until all ingredients are coarsely ground. At this stage, start adding the olive oil until the pesto is at the consistency you like. Don't over use the oil though, as you don't want the pesto to be runny. Take a baking tray, spray with olive oil. and lay the snapper fillets down, spray the top of the fillets with some more olive oil and add a thick layer of pesto on top. Now, your grill should be hot, your zucchinis half way through cooked. Put the tray under the grill and leave unattended for ten minutes. During that time, turn the zucchinis over twice. When the ten minutes are over, decorate your plates with some basil leaves, spread the zucchinis on top and share the onions that should be like a jam by now. 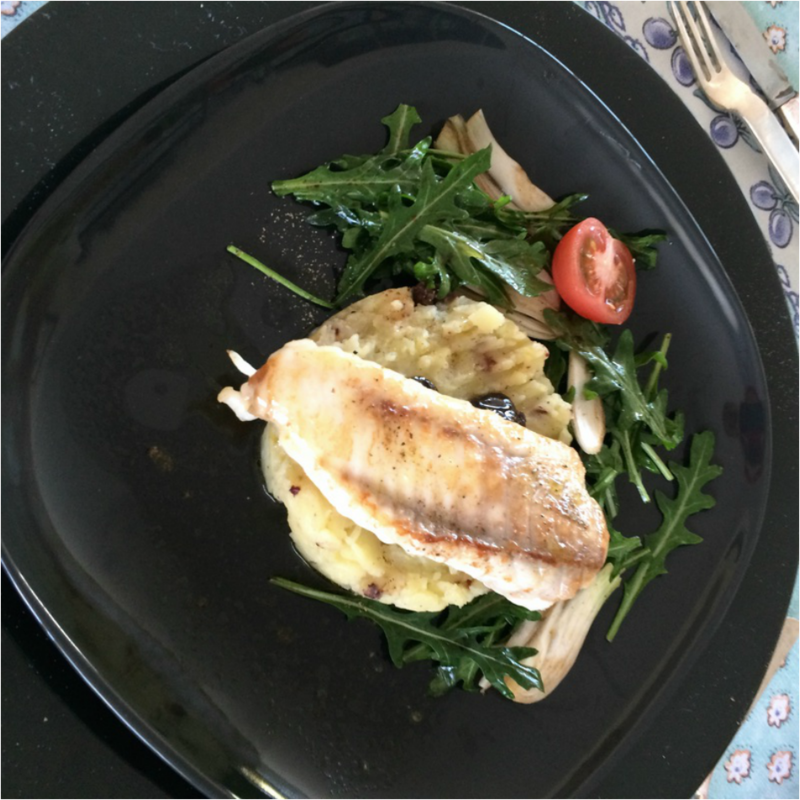 Place the fish fillets next and serve immediately. One of the best food magazine in the World comes from...no, not France, but from this tiny country in the backyard of Australia, New Zealand. Cuisine - that's its name - has won several times over the Best Food Magazine of the World Award. And more recently Cuisine Wine Country 2009 has been judged Best Drink Magazine in the world at the 2010 Le Cordon Bleu World Food Media Awards in Adelaide. I discovered it about 10 years ago, when it was still privately owned and unknown outside of KiwiLand. They happened to have their offices in the same building (Axis) as one of my business contact in Parnell, an interesting suburb of Auckland. Conveniently, this building hosts also one of my favourite restaurant: Cibo. So, my children's Mum (yes, she is still my wife after 25 years...) asked for steak and sauteed potatoes, one of my staples. But, being Mother's Day, I thought I would go out of my way and produce something of MasterChef quality. Simmer the shallots in the red wine until they are a deep-red colour and there is no liquid left. Cool completely. Beat the butter until thick and creamy in a food processor. Add the cold shallots, and salt and pepper. Roll into a cylinder in plastic wrap and freeze until needed. Sautéed Potatoes - My recipe differs from yours, Celia - and I believe the result is much better! It should take about 20mn to have the potatoes cooked, roasted outside and still creamy inside - delicious! Grind the peppercorns coarsely in a mortar or coffee grinder then tip into a sieve and shake off the powder, keeping the crushed peppercorns. 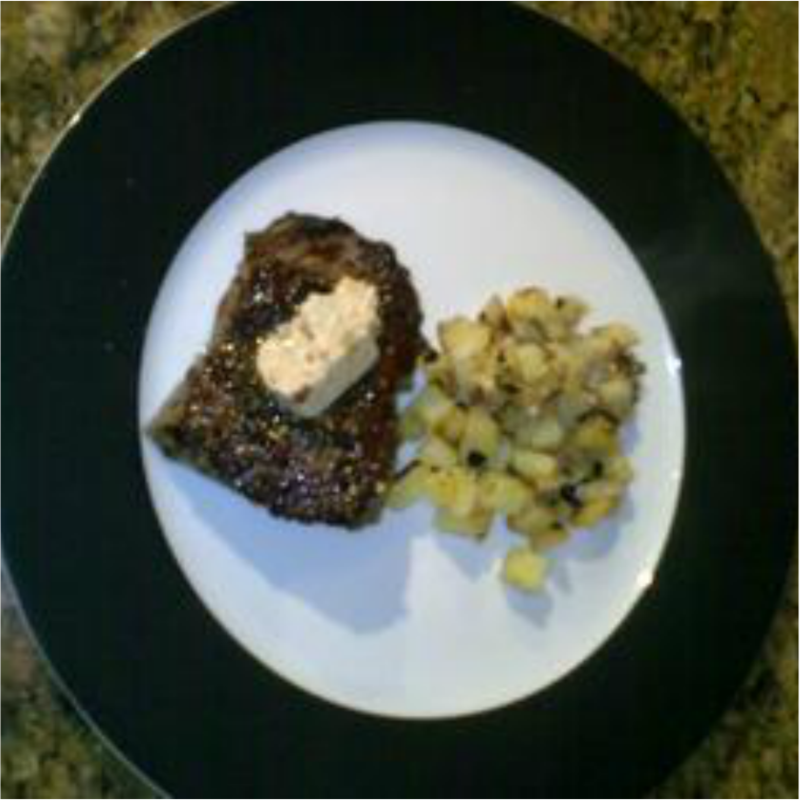 Season the steaks with salt and firmly press the peppercorns into the steaks. But not any steaks: I used the occasion as an excuse to visit the quintessential butcher in Sydney. It has been in all the design magazines, as this is more theater than butchery thanks to my good friends at Dreamtime Australia Design. It has also been featured on MasterChef recently. Owned by the founders of Vic's Premium Quality Meats, arguably one of the best butchers in Australia, you can find there all the meat you can dream of in a decor which is mind boggling. And I am talking about Victor Churchill in Woollahra. Once you have understood that there is no formal queue ( sounds like home...) and you have grabbed the attention of the next available young female assistant, she will walk you through all the options and empty your bank account in less than five minutes. I settled for 500gms of Aged Marbled Sirloin worth every penny spent and a can of French Cornichons absolutely not worth the 15 dollars asking price. (Whoever is importing Maille mustards should import their cornichons as well - no match! - Monsieur Victor, can you talk to them, please? I discovered recently that Maille is now a US product, as it is owned by Unilever..., but relax, it is still made in France). I am very particular for my cornichons because my patrenal great-grandmother and then my grandmother used to grow them in their garden in Vendee and prepare them themselves. Heat some oil in a heavy-based frying pan, add some olive oil - I never use butter in my cooking - let it heat and then add the steaks. Cook gently until each is done as you like. Rest the meat for as long as you cooked it and serve topped with a slice of red wine butter and the sautéed potatoes. Serve goat cheese with nuts and raisins bread to finish. And enjoy the company of your happy guests! Put some water to boil with salt and a dash of olive oil (sorry, George...) and when boiling, drop a few nests of vermicelli in the water. Cook for 7-8mn, and let them cook without stirring, so they keep together. Two nests per person is more than enough with 125 grms of prawns (about 7 0r 8 prawns). Cut some cherry tomatoes in two and reserve. 3mn before the pasta is due to be ready, put some olive oil in a pan, and cook the prawns 90 seconds on each side or more if you prefer them a bit more cooked. 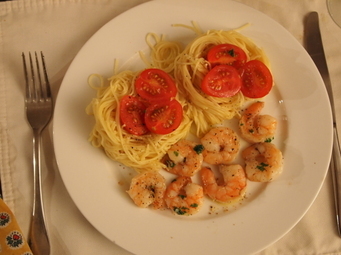 Once the pasta is cooked, remove from the water with a slotted spoon (ecumoire...) and plate up with the prawns on the side and the cherry tomatoes on top of the nest(s). Add crack pepper generously and a dash of olive oil, et voila! Dinner is ready in less than 10mns if you use packaged prawns. 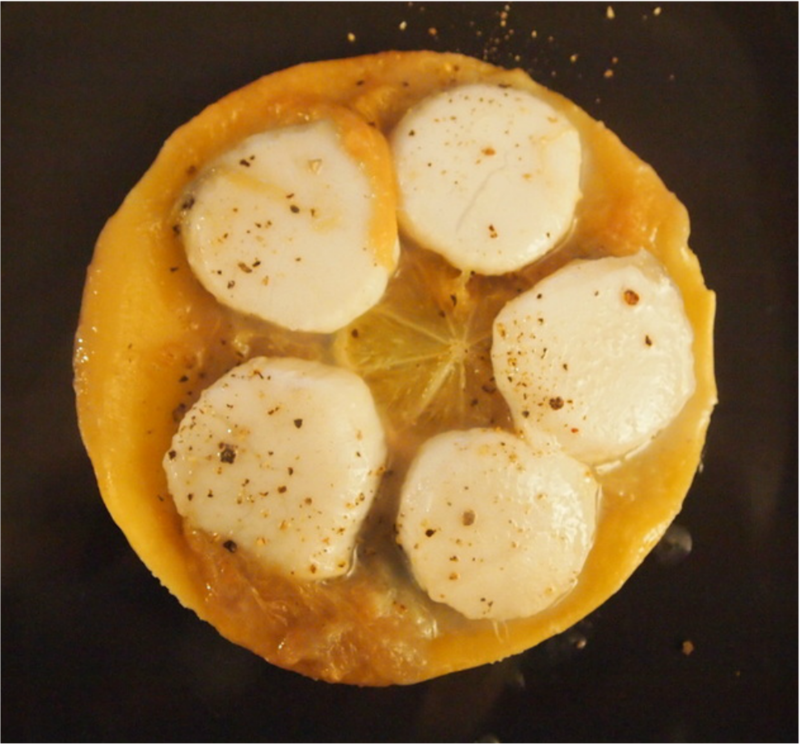 Tatin of Scallops with Rhubard and Lime - inspired by Jean-Pierre Crouzil. Recipe coming soon...just dream about it for now!